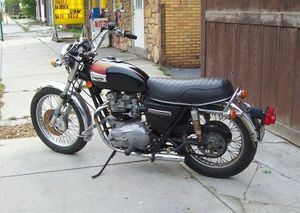 The Triumh Bonneville T140 is a 750cc, twin cylinder, four stroke, street motorcycle manufactured by Triumph during the 1970s. 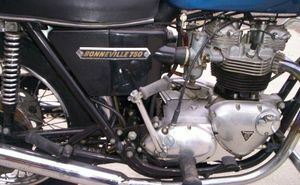 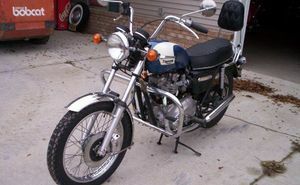 The early 650 cc capacity production Triumph Bonneville T120, often known as the duplex frame model, was replaced in the early 1970s by the T140 Bonneville, the same basic machine but with a 750 cc engine. 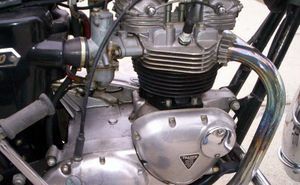 Refined from the later 'oil in frame' version of the T120, the first few T140s, designated T140V, featured a larger-capacity engine of 724 cc, a five-speed gearbox option and indicators, but still retaining drum brakes and kick-start. 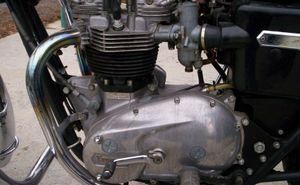 Shortly after, the engine was further bored out to 744 cc and front disc brakes were fitted (using single discs until 1982). 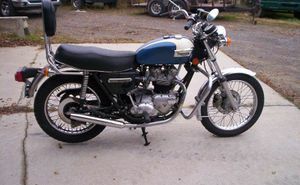 In 1975, along with engine modifications, the gearchange lever was moved from right to left to comply with new regulations mandated for the American market. 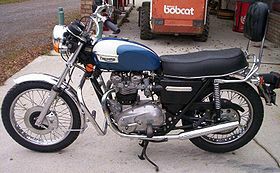 Several T140 models followed featuring various modifications and refinements until production ceased with the closure of the Meriden works in 1983. 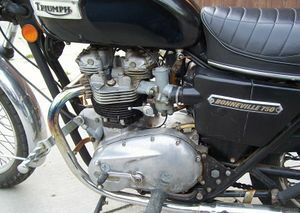 Although this should have been the end of the Bonneville, as it turned out it was not. 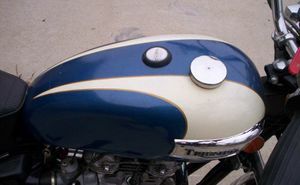 Triumph Motorcycles was acquired by businessman John Bloor, who licensed a company called Racing Spares in Devon, run by Les Harris to manufacture the T140 Bonneville. 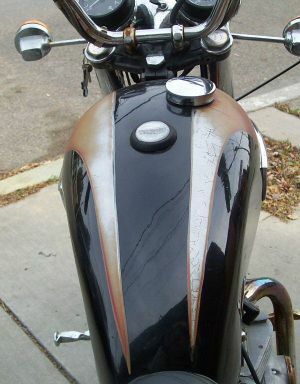 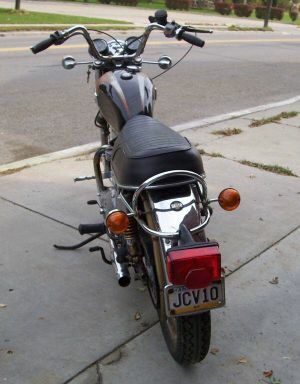 These continuation bikes are known as the 'Devon Bonnevilles', which did not reach the market until 1985, and were not sold in the U.S. Production ended in 1988. 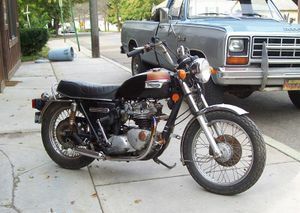 This page was last edited on 28 November 2010, at 22:26.